Playing games is something that we don’t have to do at all. We play only because we like to. Even though it is completely unnecessary, humans spend so much time playing games! This book is not about games. It’s about strategies that are used in games and can be adopted to any product we know. Yu-kai Chou was addicted to many games, and he figured out what the psychological triggers are that made him waste so much time on games. He invented a framework called Octalysis that can be used to make any product or service much more rewarding, addicting, and playful. Among all the different books that talk about these things related to the psychology of users of your product, this is probably the most concrete book, with dozens of strategies ready to use. Yu-kai Chou is an Author and International Keynote Speaker on Gamification and Behavioral Design. 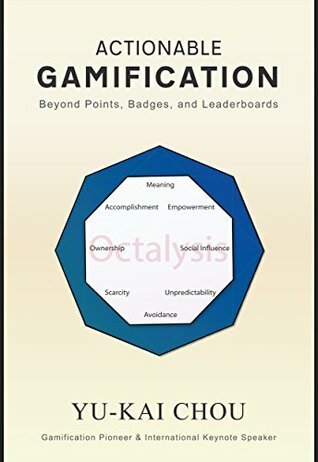 He is the Original Creator of the Octalysis Framework, and the author of Actionable Gamification: Beyond Points, Badges, and Leaderboards. He is currently President of The Octalysis Group and the Founder of Octalysis Prime. Yu-kai has been a regular speaker/lecturer on gamification and motivation worldwide, including at organizations like Google, Tesla, Stanford University, LEGO, and many more. Focus on user experience, not on functionality. Put meaning into all elements of the product. Add elements of development and accomplishment to your product. Add elements of empowerment of creativity and feedback. Add elements of social influence and relatedness to your product. Add elements of scarcity and impatience to your product.